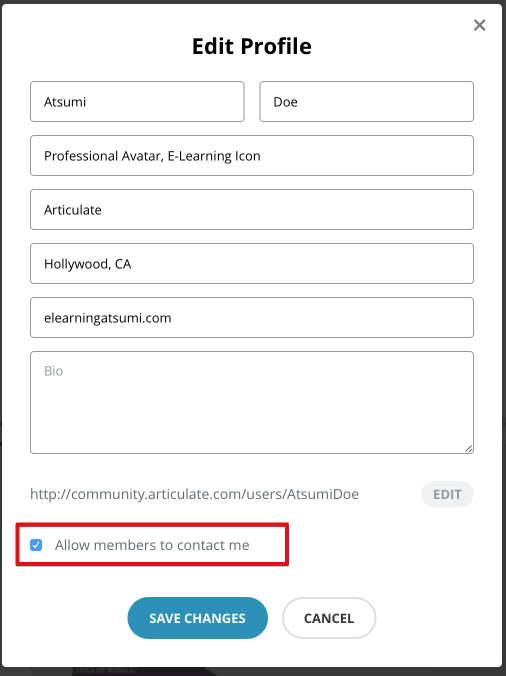 One of the single most powerful features of the E-Learning Heroes community is a feature you may not be maximizing: your user profile. Believe it or not, your user profile is one great way to make yourself more knowable. A robust profile helps people find and connect with you and your work—and making connections in a community of peers is not only helpful for self-development, learning, and professional growth, it’s also a great way to meet people and form new friendships. 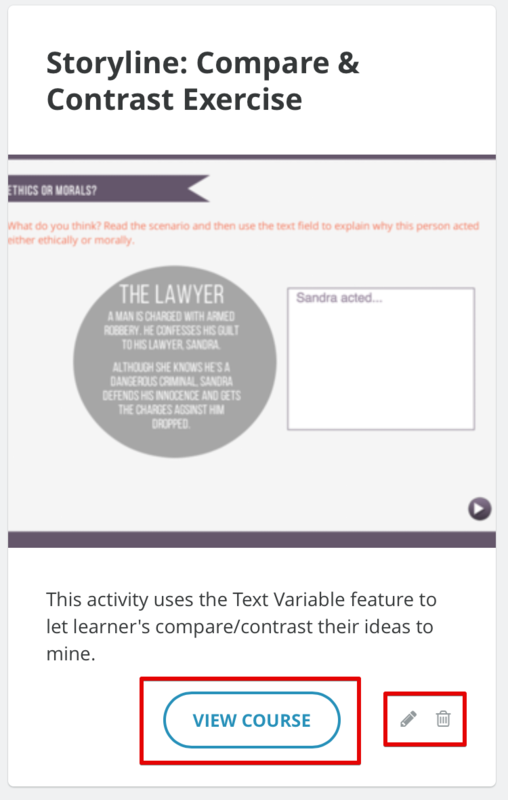 So how do you get the most of our E-Learning Heroes user profile? Here are some easy how-tos and tips to get your profile whipped into shape in a snap! Whether you’re brand new to E-Learning Heroes or just thinking that now might be a good time to update your profile, accessing your profile is easy-peasy. Simply mouse over your image in the upper right corner of any screen on E-Learning Heroes to reveal a drop-down menu of options. Click on “My Profile” from the drop-down menu to access your profile page. 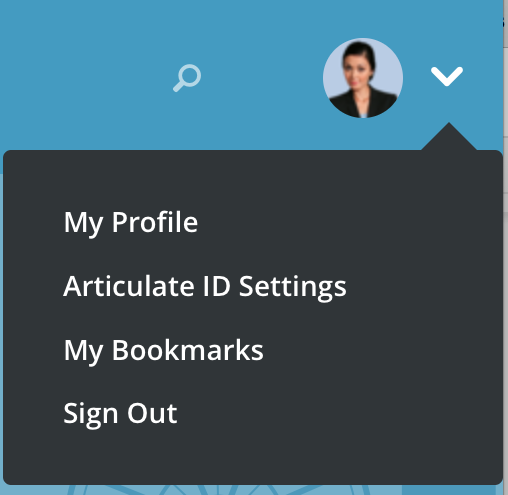 To set-up or customize your profile, click the “Edit Profile” button under your profile image. When you’re done editing your profile, click the “Save Changes” button. 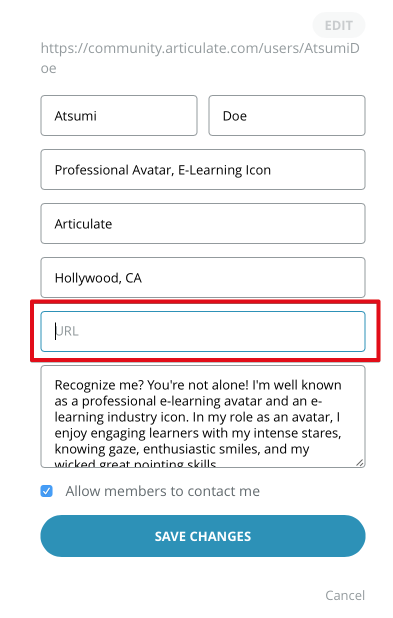 Pro Tip: The “Allow members to contact me” checkbox is checked by default. Leaving this checked adds a “Contact Me” link to your user profile. The "Contact Me" link is helpful for allowing other users to reach out to you privately. All they need to do is click the link to open up a handy email form. 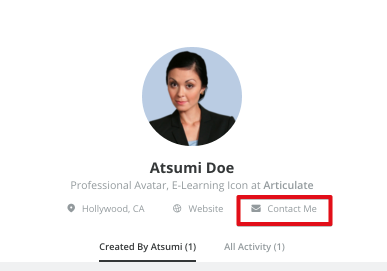 Bonus tip: This “Contact Me” feature is particularly helpful if you’re a freelancer since it gives potential clients a painless way to connect with you one-on-one. Gone are the days of paper resumes. In today’s digital world everyone’s looking for a link. 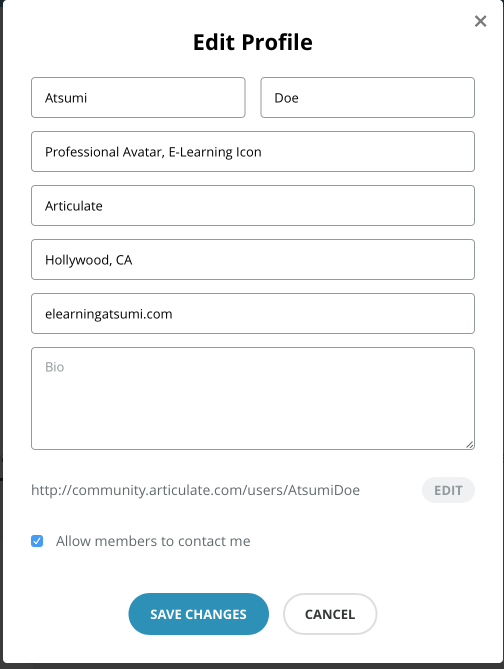 Thankfully, your E-Learning Heroes user profile makes it easy to share links to your website or blog, your portfolio, or your LinkedIn profile. Once you’ve chosen to edit your profile, simply enter your preferred website address in the URL field and then click “Save Changes” when you’re done. Pro Tip: Only the link you enter in the URL field will be recognized as a hyperlink on your profile, although you can enter more links in the body of the Bio field. 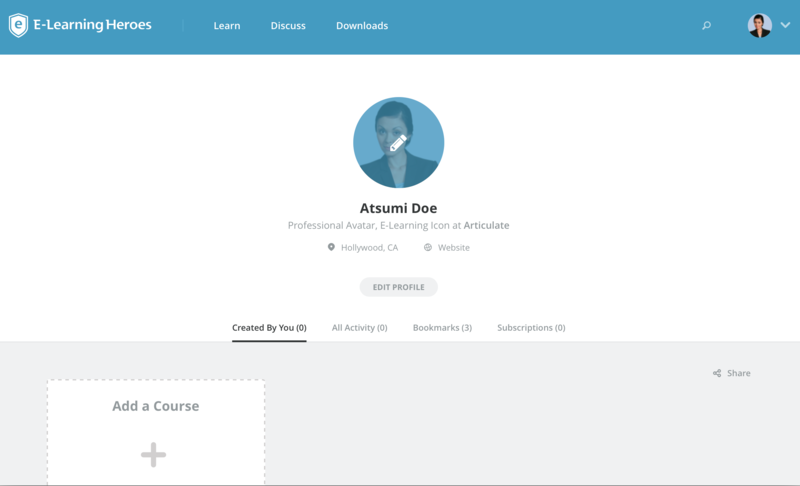 Linking to your blog or portfolio is one great way to share a little more about yourself, but another great way to show off your e-learning skills is by adding a published course to your user profile. From the "My Profile" page, click on the "Add a Course" button under the "Created by You" tab. 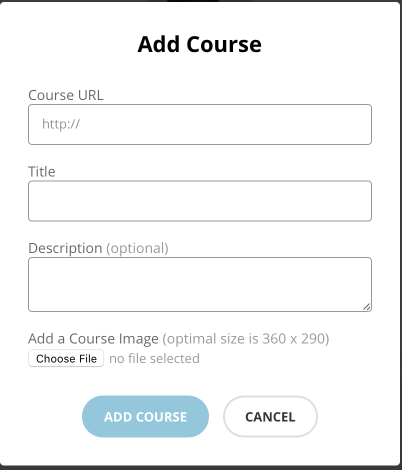 When you click on the "Add a Course" button, you'll see an "Add Course" screen with data fields to complete. 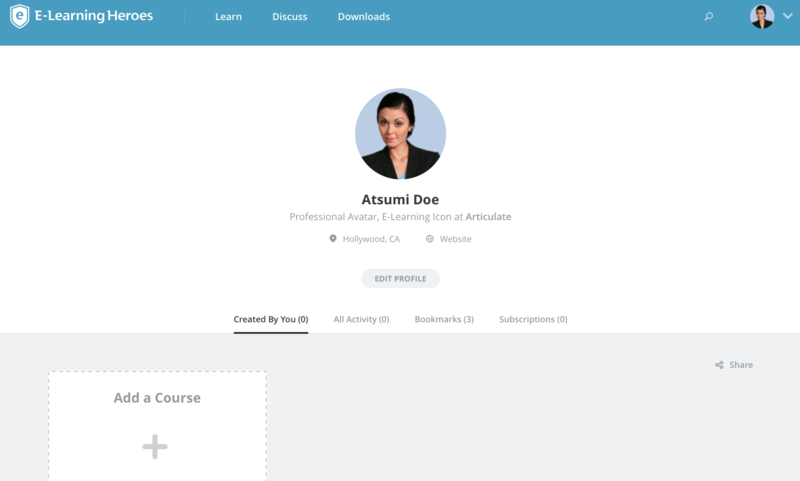 Once you've entered all the details, click the "Add Course" button to save your course to your "My Profile" page. Click the "View Course" button to see your newly uploaded course in a new browser tab. If you want to change any details about your course or remove it from your profile altogether, use the edit or delete buttons. 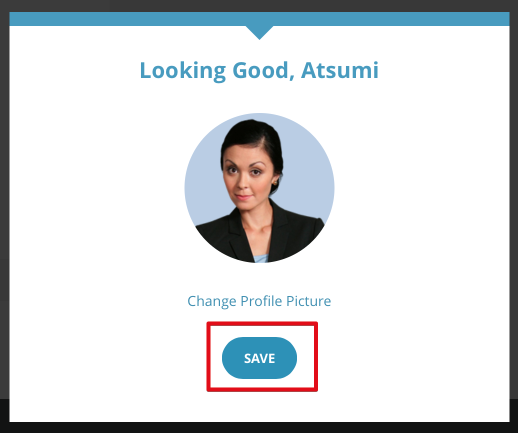 When you’re setting up or revising your E-Learning Heroes profile, don’t forget to add a great photo of yourself. People enjoying connecting with a friendly face and one of the best ways to make a positive first impression is to personalize your profile with your lovely mug! To add or edit your profile picture, simply mouse over your current profile image and then click to update it. This action takes you to a screen where you can select from two options: Upload New or Choose from Gallery. Have a friendly, professional selfie? Now is the time to make it your new ELH profile pic! 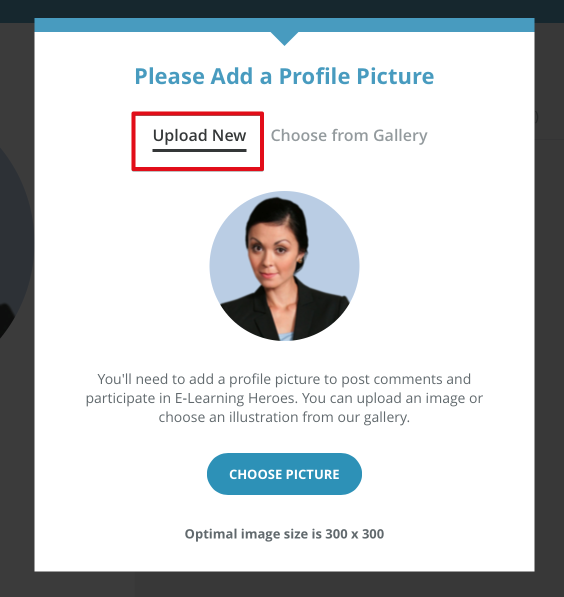 With “Upload New” selected, click the “Choose Picture” button and then browse to locate your photo. To save your new profile picture, click the “Save” button. To keep looking for just the right image, click the Change Profile Picture” link. Don’t have a suitable photo handy? No worries. Select “Choose from Gallery” and then use the arrows to browse through our collection of illustrated avatars. When you’ve found just the right one, click “Use Picture” to set it as your profile image. Pro Tip: For personal brand-building and connection, it’s tough to beat a photo. 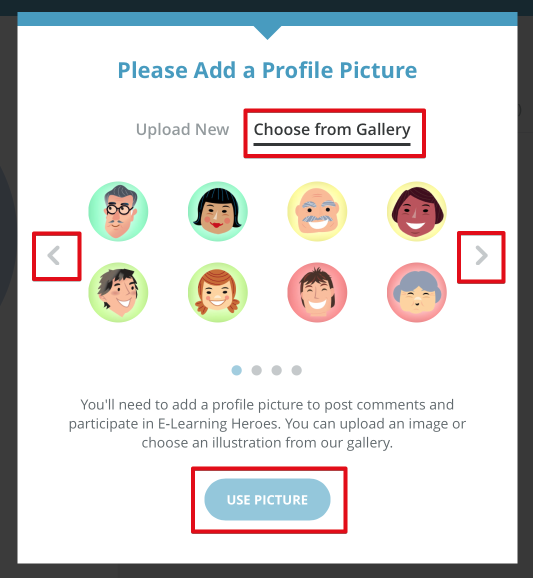 If you’re currently using one of the illustrated avatars in our gallery, consider making the switch to a photo image across all of your professional social media sites so it’s easier for people to find and recognize you! Looking for a fun way to learn all of the basics and a whole lot more? 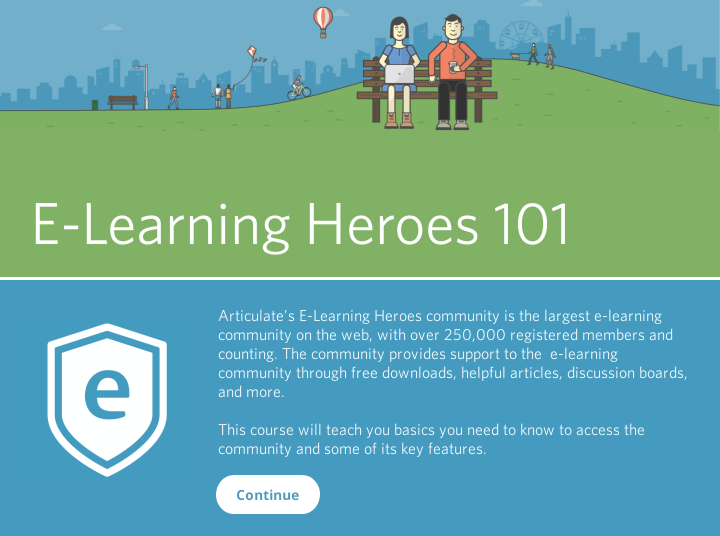 Don't miss this helpful E-Learning Heroes 101 course created by Nicole Legault. 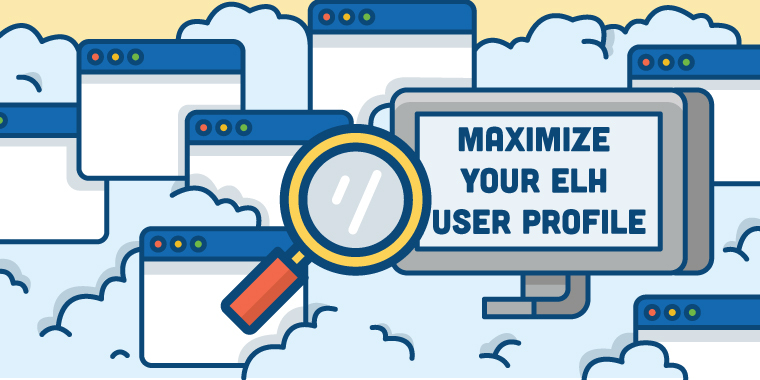 What are your tips, tricks and brilliant ideas for maximizing your E-Learning Heroes user profile? How do you get noticed? Leave us a comment below to share your thoughts. Great write-up Trina! This is an awesome addition to profiles.